To expand the use of SPICE circuit simulation to include subcircuits. To compare results of analysis, measurement, and simulation. Use the information in adding a subcircuit in LTspice to add a subcircuit to the SPICE library. Method 3 may be the easiest. Be sure not to miss the "Method 2 and Method 3: Setup" section. Sketch the voltage across D, and indicate the size of the DC and AC components. Change the sine wave to be from -10 to +10 V (or as close as you can get to that) at a frequency of 1 kHz. Sketch the voltage across the diode for at least two cycles of the sine wave. Summarize the operation of the zener diode, given what you know about zener diodes. Explain what's different from the ordinary diode studied earlier. Explain your results to the lab instructor before continuing. Use the information in adding a subcircuit in LTspice to add a subcircuit to the SPICE library. Method 3 may be the easiest. 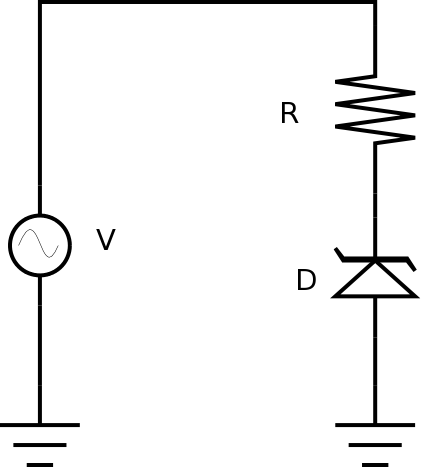 Do 2 transient analyses to produce a graph of voltage across the diode versus time to compare with the two sketches from above. Compare the values from the actual circuit to the values from your analysis and measurements above. Show your results to the lab instructor. Save your circuit and your LTspice files for future use. Before you leave the lab, have the lab instructor sign your lab notebook immediately after your last entry.